Demands for democracy are unlikely to make headway in fragmented societies such as Syria and Lebanon. While Egypt and Tunisia are historically and geographically well-defined entities with fairly homogeneous populations and national attributes, Syria is dominated by a small minority sect whose fate hinges on the survival of President Bashar al-Assad's regime, which will not flinch from crushing pro-reform demonstrations, even if these do not demand a systemic change. Nor is political reform conceivable in Lebanon—a country suffering from a serious sovereignty deficit resulting from deep-seated sectarian divisions. 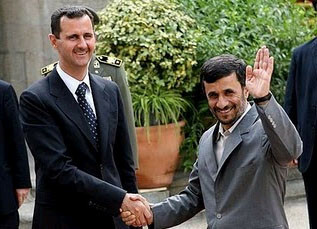 Having publicly precluded the spread of the Tunisian and Egyptian upheavals to Syria, President Bashar Assad (left, with Iranian president Mahmoud Ahmadinejad) has been loath to acknowledge the true nature of the rapidly spreading discontent in his own country, repeatedly attributing it to foreign attempts to subvert Syria. Lebanese analysts and politicians have unabashedly claimed credit for the Arab uprisings, which, in their view, are bound to culminate in the establishment of democratic political systems throughout the region. Speaking on the sixth anniversary of the Cedar Revolution last March, its politically battered leader Saad Hariri asserted that the popular uprisings in Tunisia, Egypt, and Libya were all inspired by those Lebanese who in 2005 converged in downtown Beirut to demand the departure of Syria's occupying army from the country. This process, according to a London-based Lebanese publication, amounted to nothing short of "the beginning of the collapse of the Arab equivalent of the Berlin Wall … a new Arab order in which political authority is transferred periodically and peacefully." At the same time, this rhetorical hype has been marred by apologetics and blatant misrepresentation. Thus, for example, columnist Hassan Sabra entreated Arab youths "to take revenge for their grandparents who unsuccessfully rebelled against despotism and their fathers who regrettably appeased it and bequeathed them shame and sorrow." This, however, did not prevent him from empathizing with Egypt's Husni Mubarak, "who served his country in peace and war and seemed ready to step down," or from commending Saudi King Abdullah for "launching his own revolution several years ago for the sake of transforming his society long before the spring of reform has crept up many Arab publics' list of priorities." For their part, Assad's supporters in Syria and Lebanon dismissed Hariri's claim to parenthood of the Arab uprisings (ridiculing the Cedar Revolution as the Gucci Revolution due to the presence of many high-heeled young women in the daily sit-ins following the February 2005 assassination of former Lebanese prime minister Rafiq Hariri), equating the public demand for freedom not with a yearning for democratic participation but with standing up to the alleged machinations of the United States and Israel. "The Arab publics admire the Syrian policy line because it arrested Arab collapse and is currently well-positioned to take the initiative to win back usurped Arab rights," argued the prominent anti-Hariri journalist Nizar as-Sahli while Subhi Ghandour, a Lebanese analyst and director of the Arab Dialog Center in Washington, reduced the Egyptian uprising to "an endeavor to restore for Egypt its leading role in advocating the just causes of the Arab nation." On March 12, 2011, the Arab League urged the U.N. Security Council to impose a no-fly zone over Libya to protect the civilian population from strikes by Mu'ammar al-Qaddafi's air force. The move was opposed by Yemen, Algeria, and Syria—probably the league's most fragmented countries: Yemen is divided along tribal, sectarian, and regional lines; Algeria's political fault line pits Arabs against Berbers and Islamists against secularists; and in Syria, the divide is most pronounced in that it places the ruling Alawite minority, no more than 12 percent of the population, against the rest of the country's ethnic-religious mosaic. Small wonder, therefore, that the regime's supporters condemned the no-fly zone in harsh Baathist rhetoric, reminiscent of the pan-Arab discourse of the 1950s and 1960s: "This weird decision appeared as if it was issued by the U.S. Congress or Israeli Knesset." Assad's resentment of the international protection of Libyans from their heavy-handed ruler is not difficult to understand. Evidently equating democracy with regime change, the Syrian dictator has been loath to loosen his grip on his long suffering subjects lest even the most modest political reform might lead to his undoing. The Damascus regime may digress from David Ignatius's assertion that "if the experience of other countries over the past two months shows anything, it's that delaying reform too long in a one-party state like Syria is potentially a fatal mistake," yet it has missed no opportunity to underscore Assad's personal commitment to reform despite the foreign conspiracies confronting him: "Mr. President Bashar Assad perseveres in his reform mission and cannot possibly be sidetracked by those who bear malice against Syria and wish to destabilize it." To be sure, the road to reform is rarely easy or smooth, and even the most thorough reforms hit the occasional snag. As an editorial in the official mouthpiece of the regime put it: "There is no doubt that the march of reform, begun several years ago, has made progress at different levels, but at the same time, it has not been unblemished or corruption-free." Yet this does not mean that the authorities will put up with "a foreign conspiracy" masquerading as public protests and "aimed at destabilizing Syria and the rest of the region," to use the words of Buthaina Sha'ban, Assad's advisor for political and media affairs. It is doubtful whether the official clichés about Assad's unwavering commitment to reform have struck a responsive chord with ordinary Syrians. Even some of the regime's supporters have become increasingly disillusioned with its neglect of the real issues pertaining to reform. One such critic is veteran Lebanese analyst and former Arab League official Clovis Maksud. Noting that, as early as April 2005, Assad requested the executive director of the U.N. development programs to propose reform policies for presentation before the Tenth Baath Party Congress, which convened two months later, Maksud expressed his astonishment at the failure to act on these reforms "that were adopted by the congress and the Syrian cabinet." Nor could he hide his disapproval of the regime's derision of the demonstrators as "lackeys of foreign agents." The fact of the matter is that despite his inner insecurity, Assad seems to have concluded that the Western intervention in Libya is not repeatable in the Syrian context, apparently drawing some comfort from Hillary Clinton's assurance after the killing of dozens of protesters in the northern port city of Latakia that "the USA will not interfere in Syria in the way it has in Libya." Moreover, judging by his defiant speech of March 30, in which he laid the blame for the protests on "saboteurs [who] tried to undermine and divide Syria and push an Israeli agenda," Assad seems to believe that he has received a new lease to rule Syria as he sees fit whereby "reforms are not a wave that we ride, and we will not proceed hastily." Ribal al-Assad, director of the London-based Organization for Democracy and Freedom in Syria, dismissed his cousin's declared intention to reform the Syrian political system as "a big, deceptive campaign in the name of democratic reform." Therefore, "it seems inevitable that protest may soon crack the regime's brittle political immobility … the birth of freedom … is not easily forgotten—or trumped by state handouts and vacuous statements by a distant, self-isolated leadership." What may be working in Bashar al-Assad's favor is that the protest movement, while spreading from the southern border city of Dar'a to other parts of Syria, including Damascus, still appears too weak to seriously challenge his regime, owing to the heterogeneity of Syrian society, which discourages cohesion among the opposition. Official statements and press editorials leave no doubt regarding the regime's readiness for an all-out showdown: "We are in the midst of a confrontation and not on a picnic. The country is facing a real battle with foreign forces spending tens of millions of dollars, whose aim is to destabilize Syria." This decision came only three days after the authorities had promised to exercise maximum restraint in dealing with public protests: "There are orders from the highest echelons to all security agencies to refrain from opening fire on demonstrators, even if they deliberately wound or kill politically disinterested countrymen." It is highly unlikely that these contradictory statements demonstrate a shift of course in dealing with the protests since the government's vacillation has had little impact on the scale and intensity of regime repression. Confronted with the gravest domestic challenge to the Assad dynasty since 1982, when Bashar's father, Hafez, killed tens of thousands of civilians in the northern city of Hama in an attempt to suppress the ongoing, nationwide Islamist revolt, the regime decided to invoke terrorism as a dominant factor overshadowing the demands for reform. Accordingly, the government has repeatedly claimed that armed gangs keep opening fire on protesters, army troops, and security forces. Oddly enough, these armed gangs have conspicuously failed to open fire on demonstrators and security personnel when regime-organized, pro-Assad rallies caused traffic congestion in major Syrian cities. As Anis Karam, the Lebanese chairperson of the American-Middle Eastern Congregation for Freedom and Democracy, put it, the regime has been "labeling demonstrators as outlaws to justify its mass killings." Indeed, the authorities have clearly indicated that they have no intention of desisting from their excessive force in quelling the disturbances. Assad even fired Samira al-Masalima, editor in chief of the state-run Tishrin daily, after she told al-Jazeera television that opening fire on demonstrators in Dar'a was "a security breach because it violates the explicit orders of President Assad." The Syrian protests may intensify, but they are unlikely to create a wholly new political reality. Though winning some seemingly major concessions, notably the lifting (on April 19) of Syria's 48-year-old state of emergency, the balance of power overwhelmingly favors the regime for now. Some Lebanese writers expect the Arab uprisings to reach Lebanon. Nasser al-As'ad, a member of Hariri's party and a former activist in the defunct Communist Action Movement, believes that "the ultimate goal of the Arab risings is the installation of modern democracies and the emergence of a pluralist Arab order." Since Lebanon is a mirror image of the state of affairs in the region, he reasoned, any positive developments there were bound to have a similar impact on Lebanese politics. Lebanese intellectual Karim Pakraduni has been similarly upbeat, arguing that Lebanese youths are no less capable of effecting change than their Arab counterparts elsewhere and prophesying the "eventual demise of Lebanon's confessional political system and the inauguration of a civil polity on its ruins." Likewise, the communist-minded Lebanese Youths Movement called for a mass demonstration to spark the process of bringing down the country's confessional system: "Why do we accept to be ruled by a confessional system that has lasted longer than the combined regimes of Mubarak, Ben Ali, and Qaddafi?" Very few people showed up for the demonstration and repeated calls failed to attract a significant number of participants. This did not surprise prominent columnist Talal Salman, who lamented the Lebanese exception in the age of Arab revolutions: "The nature of the country's political system prevents the Lebanese from ridding themselves of the shackles of quiescence and attaining their natural right of becoming citizens, and not just subjects or hapless followers of confessional leaders." For his part, political analyst Ahmad Ayyash sees no chance for the Lebanese people to follow the Egyptian example "since the country does not have a solid and cohesive regime to rebel against. The Lebanese political system amounts to nothing more than a small bourgeoisie and sectarian interests patronized by conflicting regional and international powers." Likewise, Lebanese commentator Michael Young finds the Arab upheavals unworkable in the context of the country's sectarian divide, making a case for shielding Lebanon against its vagaries in fear that the destabilization of the Arab world lead to a "Sunni-Shiite conflict in the country [that] would be devastating for all." As much as the Lebanese are focused on developments in the Arab countries, very few of them are eager to start an uprising of their own. Attributing their country's travails to foreign meddling, they content themselves with considering the regional changes as a positive development without expecting them to affect their own country. Until very recently, most political scientists and commentators considered the Arab world impervious to change. They were wrong. Arab publics have been gathering enormous pent-up frustration for at least two generations, and all that was needed for its release was an appropriate spark. This was provided by the self-immolation of an ordinary Tunisian, which served as a devastating, political indictment of the magnitude of ordinary people's suffering at the hands of self-aggrandizing ruling elites and set in train the momentous chain of events sweeping the Middle East. Yet it is one thing for the Arab uprisings to get started; it is quite another for them to reach the ultimate goal of empowering the people and introducing true democracy. These uprisings are making the Arab world as unstable as ever. Heightened instability is likely to persist for years to come. Hilal Khashan is a professor of political science at the American University of Beirut. An-Nahar (Beirut), Mar. 14, 2011. Al-Hawadith (London), Feb. 11, 2011. Ash-Shiraa (Beirut), Feb. 7, 2011. Al-Akhbar (Beirut), Mar. 14, 2011. Ath-Thabat (Beirut), Jan. 21, 2011. Nabd Suria (Beirut), Feb. 10, 2011. The Daily Star (Beirut), Feb. 28, 2011. As-Siyasa (Kuwait), Apr. 10, 2011. Tishrin (Damascus), Mar. 20, 2011. BBC Arabic, Mar. 26, 2011. The Guardian (London), Mar. 27, 2011. As-Safir (Beirut), Mar. 31, 2011. BBC Monitoring, Feb. 5, 2011. The Daily Star, Mar. 3, 2011. Al-Watan (Damascus), Mar. 24, 2011. Al-Muharrir al-Arabi (London), Apr. 2, 2011. BBC News, Apr. 20, 2011. Now Lebanon (Beirut), Mar. 5, 2011. Al-Jadeed TV (Beirut), Mar. 3, 2011. The Daily Star, Mar. 24, 2011. Related Topics: Lebanon, Syria | Hilal Khashan | Summer 2011 MEQ receive the latest by email: subscribe to the free mef mailing list This text may be reposted or forwarded so long as it is presented as an integral whole with complete and accurate information provided about its author, date, place of publication, and original URL.